Canon has said that the response to its special edition EOS 60Da DSLR has been excellent. Introduced earlier this year, the Canon EOS 60Da features a modified low pass filter, making it more sensitive to hydrogen-alpha wavelengths of light. David Parry from Canon UK told TechRadar, "It's doing really well, people are clawing to get at the 60Da, people are desperate to get hold of one and try it out." 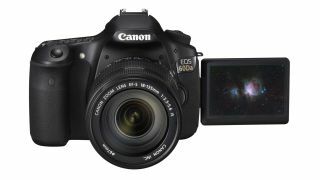 Designed especially for use when shooting astronomical phenomena that are characterised by distinct red colours, all other specifications of the camera are the same as the original Canon EOS 60D. These include an 18 million pixel sensor, Digic 4 processing and a vari-angle articulated screen. A normal DSLR incorporates an infrared filter to limit the amount of Ha light passing to the sensor, which usually prevents unwanted colour artefacts in the final image. Available from June, the Canon 60Da price is around £1,175 in the UK or $1,499 in the US, making it more expensive than the original version, which can currently be picked up for around £800/$1,000 (body only).